Tenants will be protected from unfair letting fees and will see their tenancy deposits capped at 5 weeks’ rent, putting hard-earned cash back in their pockets, thanks to a new law being ushered in today (12 February 2019). 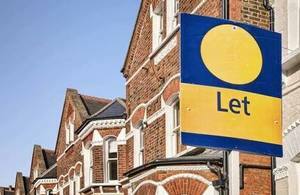 Unexpected letting fees and high deposits can make properties harder for people to afford and are often not clearly explained upfront – leaving many prospective tenants unaware of the true costs of renting a property. The Tenant Fees Bill, which has received Royal Assent today and now becomes an Act, puts an end to costly fees imposed by landlords or agents – with the ban on fees to come into effect from 1 June. It is expected to save tenants across England at least £240 million a year, or up to £70 per household. The Act also caps the security deposits that renters pay at the start of their tenancy at 5 weeks’ rent, giving people the assurance that legally they cannot be expected to pay more than this to secure a property. "Tenants across the country should not be stung by unexpected costs from agents or landlords. "This Act not only delivers on our promise to ban letting fees but also caps deposits at 5 weeks’ rent and sets out how and when landlords can charge tenants fees – helping renters keep more of their hard-earned cash. "This is part of our ongoing action to make renting fairer and more transparent and make a housing market that works for everyone." Under the Act, landlords and agents are only able to recover reasonably incurred costs from tenants and must provide evidence of these costs before they can impose any charges. This will put a stop to, for example, tenants being charged hundreds of pounds for a damaged item that actually only costs a few pounds to replace – such as £60 to replace smoke alarms. The Act also ensures that tenants who have been charged unfair fees get their money back quickly by reducing the timeframe during which landlords and agents must pay back any fees that they have unlawfully charged. Taken together, these provisions help reduce the costs that tenants can face at the outset, renewal and termination of a tenancy. The Act is part of a wider package of government reforms aimed at rebalancing the relationship between tenants and landlords to deliver a fairer, better quality and more affordable private rental market. We have introduced a range of powers for local authorities to enable them to crack down on the small minority of rogue landlords and agents who let unfit properties. This includes fixed financial penalties of up to £30,000 and banning orders – possibly for life – for the most serious offenders. Ministers have also extended mandatory licensing for Houses in Multiple Occupation to improve living conditions of tenants in shared homes and tightened up rules on smoke and carbon monoxide detectors. Private tenants can also apply for a refund of up to 12 months’ rent if their landlord does not deal with health and safety hazards in their home. These measures are all part of ongoing government action to protect tenants and drive up standards in the private rented sector – helping make a housing market that is fairer and works for everyone.